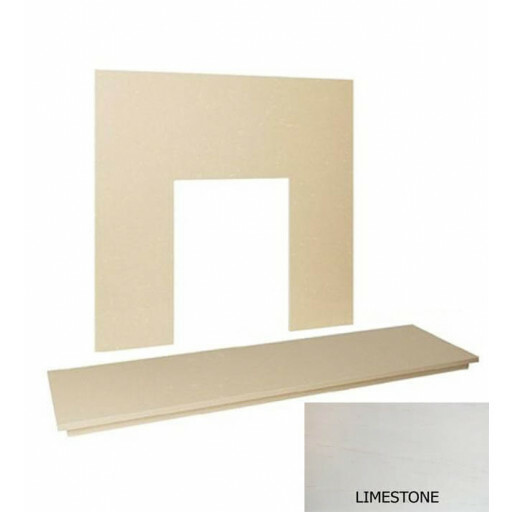 This hearth and back-panel set features a beautiful, high quality matching marble hearth and back panel set in a natural limestone colour. A perfect fit for any home, this versatile set compliments all colours and styles. This set is not only attractive, but also practical, as it comes with a three piece back panel to suit any standard sized gas or electric fire you desire. Be the talk of the town, or just your friends, with this dazzling set made of the finest quality of materials. This beautiful marble hearth and back panel set in the colour "Natural Limestone" is sure to elevate the beauty and value of any home. Open your home to this set and gain warmth, light, and comfort as you spend your time bundled up cosily by an elegant glow. The possibilities are vast, so why wait? All that's missing is a blanket, a delicious beverage, and most importantly, you.